Get dental veneers at an award winning, professional, modern dental clinic in London. Our porcelain veneers are the quick-fix route to a perfect Hollywood smile, hiding all manner of imperfections and giving your mouth the equivalent of a face-lift. Cosmetic dental veneers are ultra-thin shells of enamel like porcelain that are handcrafted by dental ceramists and permanently bonded to the front of the teeth. They are generally placed on front of teeth that are severely discoloured, poorly shaped or slightly crooked, chipped or worn. They also may be used to correct uneven spaces or a gap, or to lighten front teeth that are naturally yellow or have a grey cast which can’t be whitened by bleaching. The dental veneer procedure can be completed in two dental visits over the course of 2 weeks. The visits are comprehensive and can require several hours of examination and tooth preparation. 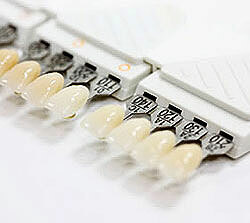 We work with you to select the best tooth colour or maybe a number of shades for extra detail and harmony. As a part of this process, we occasionally recommend teeth whitening before you begin the porcelain veneer treatment to achieve the best results. Based on diagnostic wax-up models, we will determine dimensions of porcelain veneers that will suit your face and then we conclude how much tooth structure needs to be altered if any. 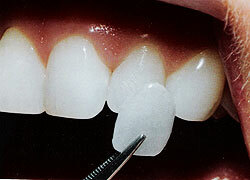 Whenever possible, we opt for prepless veneers to preserve maximum tooth structure. We then take an impression of your teeth from which a mould of your mouth will be made. We also take several digital photos to communicate to the master ceramist the desired results. Since there is an approximately two week period during which the master ceramist must fabricate the veneers, temporary veneers are fabricated and fitted. The temporaries will give you a preview of the expected outcome and also help us identify adjustments that may be needed during the fabrication of the permanent tooth porcelain veneers. To find out more about dental veneers, or to book an appointment at our dental clinic in London, call 020 7148 7148, email info@thewellingtonclinic.com or send us a message using the below contact form.